During a lovely trip to our local farmer's market last Friday, I discovered I am allergic to mangoes! Go figure! I never knew that in my 28 years of life! I have never eaten mangoes before, but tried one for the first time on Friday. It actually tastes pretty good. The texture is weird, but they are juicy. My husband didn't care for them at all. Almost immediately after eating the mango I felt the corners of my mouth stinging. I assumed it was because I was eating so many acidic citrus fruit. 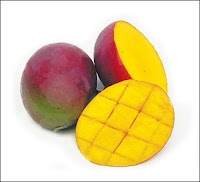 After doing some quick research on google I found out there is a cross section between mangoes and poison ivy. The nectar has the same chemicals from poison ivy found on the outside of the mango. So, if you bite into a mango be careful! I am happy to say the allergic reaction went away and I no longer have a rash.